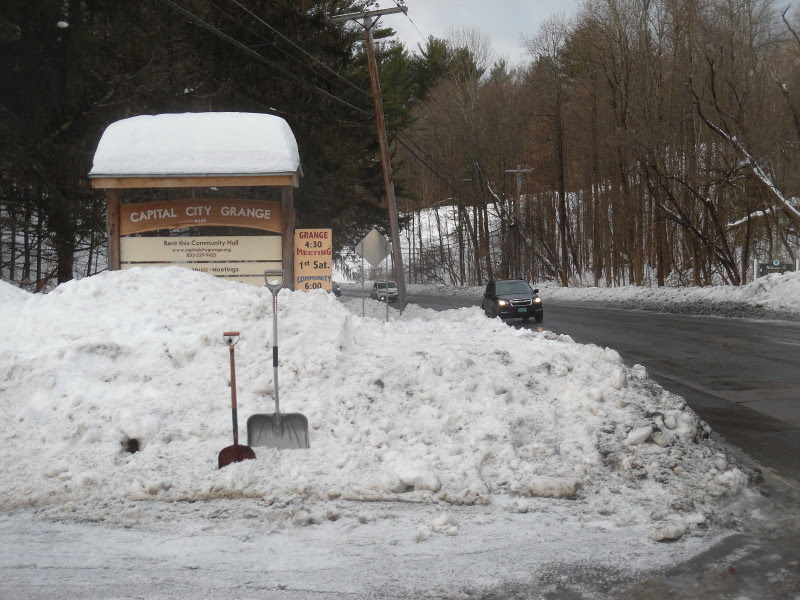 Did you know we are halfway to Spring?–shoveling snow, cleaning the Grange Hall, and meeting on Groundhog day! Grange sign–before, during and after The snow-plowing by SR Services during the snowstorm on Jan. 19 & 20 was great–but as usual, the snow had to go somewhere! The top picture below this caption show the pile that was in front of our sign next to the driveway, just after I hung up the Grange Meeting sign on Monday 1/21. As you can see, not much was very visible! This included very limited sightlines when looking for northbound traffic coming from the left as you leave the driveway. 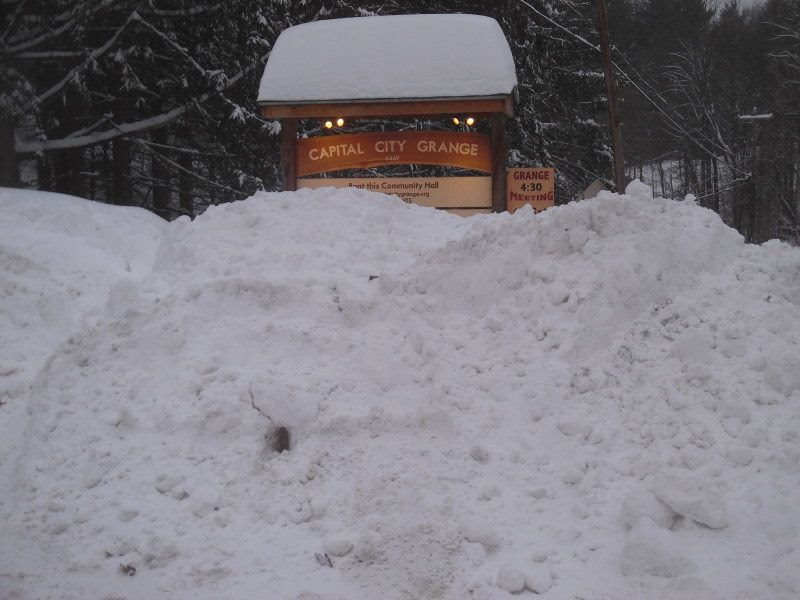 So I sent out a survey & invitation to help remove snow. Did you get this survey? Let me know if you did! 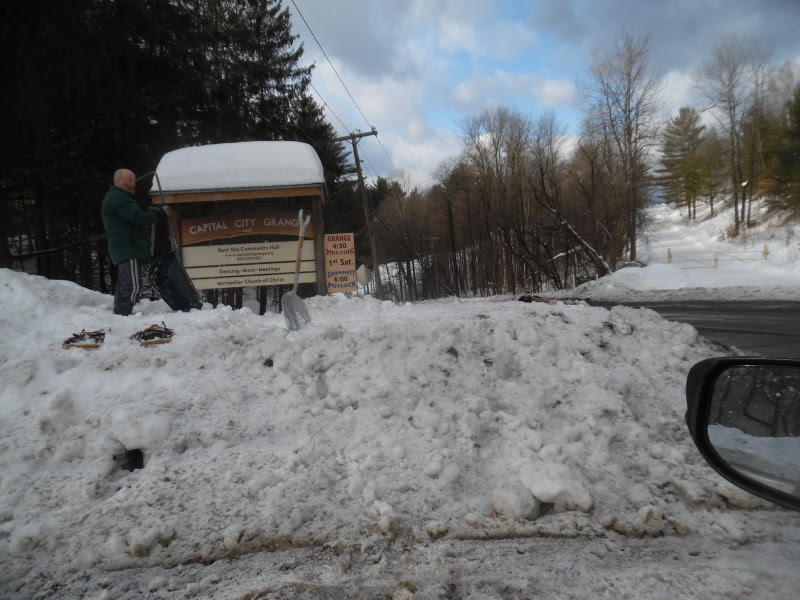 Many thanks to Kurt Giavara, who shoveled down the outer edge without waiting for company! And to Carl Etnier–the one person who answered the survey, and came to help me on Friday morning, the 25th. Picture #2 shows the pile after Kurt’s hard work; picture #3 shows Carl on the remaining pile after he and I continued the plane that Kurt established. 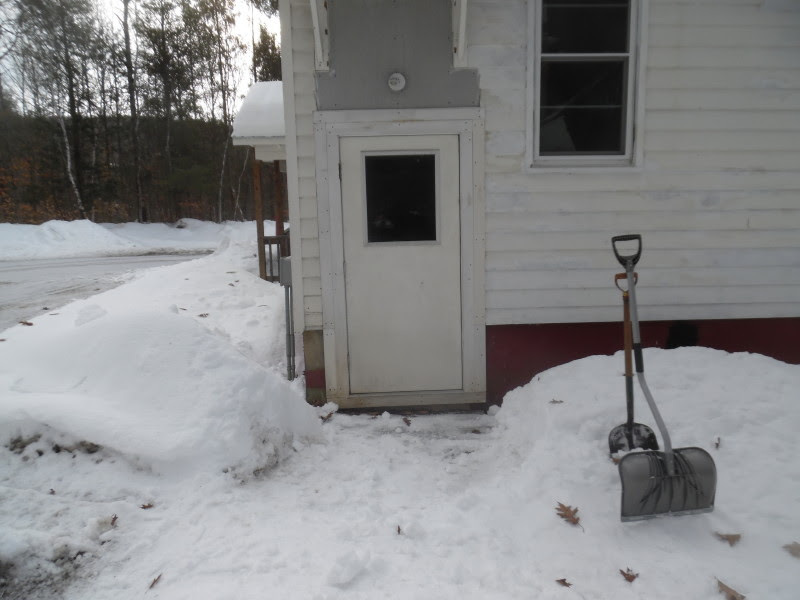 Pictures #3 and 4 show the fire exit, before and after Carl and I shoveled that out. From the top: Stan Carlson folds up curtains (to be laundered, by Merry), Stephen Wright replaces a cleaned lamp globe (he didn’t break any of them! 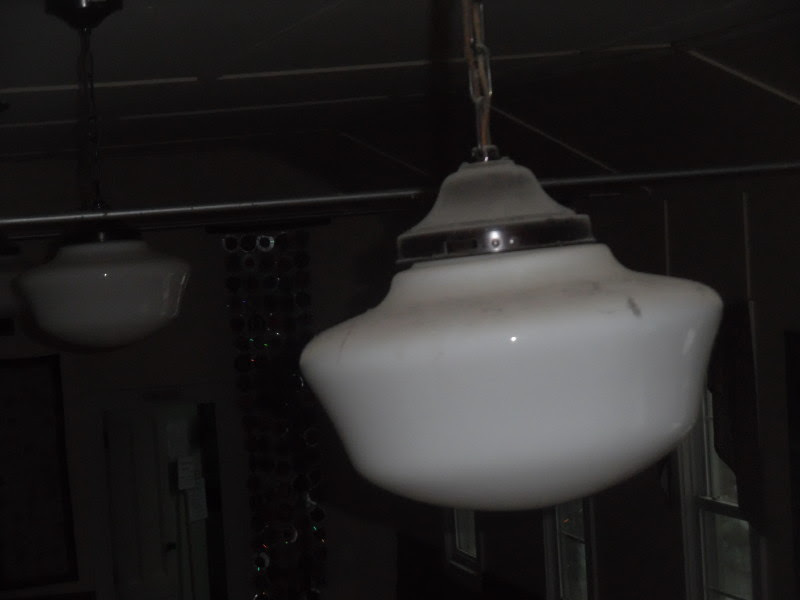 ), Tossy Garrett cleans light diffusers, with Henry & Calvin supervising, Jody Pettersen cleans the refrigerator, Merry Shernock cleans and organizes the Dance closet, and shows off the blinds in the upstairs bathroom–white once more! At the bottom, Stan, Tim Swartz and Carl Etnier roll up the 2nd-to last of the 6 floor mats which got cleaned. Not shown: Calvin & Henry cleaning the walls of the upstairs bathroom! Sean and his sons Owen & Andy cleaning the mats, and kitchen cabinets! Liz Benjamin cleaning more light diffusers in the kitchen! Merry cleaning the stage and the piano! Carl cleaning the foyers!…and the feast we had for lunch, provided by various volunteers who came, plus mac & cheese dropped off by Elizabeth Templeton. All of this took place the day after the nearly 2 feet of snow, with outside temperatures in the single digits at most. 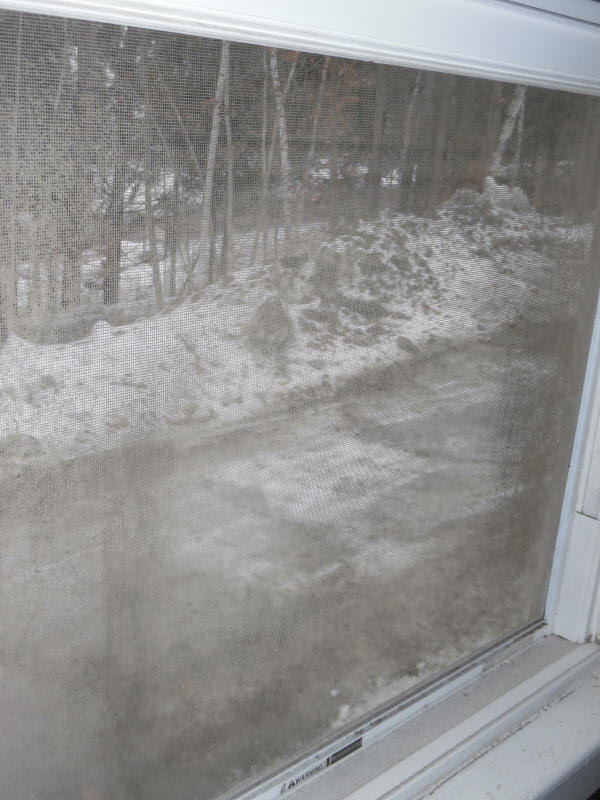 As you can imagine, it was not a good day to open and clean the windows and screens–so we’ll be back when the weather is warmer to get to those. See my previous Grange Notes for “before” photos to truly appreciate the cleaning we did. Thanks to one and all! We’ll meet again on Saturday, Feb. 2nd. As noted in the subject line for this email, this is halfway between the Winter Solstice, with the shortest day of the year, on about Dec. 21, and the Spring Equinox on about Mar. 21st. I know I’m glad for some morning light sooner after I get up, and some extra daylight in the afternoons. I look forward to seeing Grange members and friends at 4:15 PM on Saturday for our monthly business meeting. Anyone is welcome, no password–consider yourself invited! Our meeting will feature an on-screen financial report from Treasurer Merry Shernock, who will use the Quickbooks Online service to show us how the last year has gone. She’ll use the projector recently donated to the Grange to put her screen image on the Grange’s projection screen for all to see. In 2018, we were able to invest some money in the Grange Hall, had increased use of the Hall by many local families and organizations. We also had some increased costs which accompany that increased use. The balance of expenses and income will be discussed, along with how well we are fulfilling our commitment to host events for Berlin residents at no charge, in return for the freedom from property tax we were voted in 2016. We will have to get that renewed in 2021, which is coming closer! We’ll also hear about the developing relationship we have with the VT Youth Theater, which is renting our Hall for rehearsals on a regular basis. We have been working with them to provide storage space and other modifications, based on a commitment to long-term usage plans. Having this relationship with a theater company should enhance the case the Friends of the Capital City Grange Hall will be making for another grant from the Arts Council. We will also be talking about the general issue of storage space, and how to balance the needs of existing and future tenants for storage of items needed for their Grange Hall use. Once again, this is the result of pressures from success–increased usage of our Hall for its purpose of community service for family and community organizational events. Our meting will also include the reports on agricultural issues (it’s Farm Show right now! ), VT Legislative issues, Health Concerns, and the Grange Hall report. 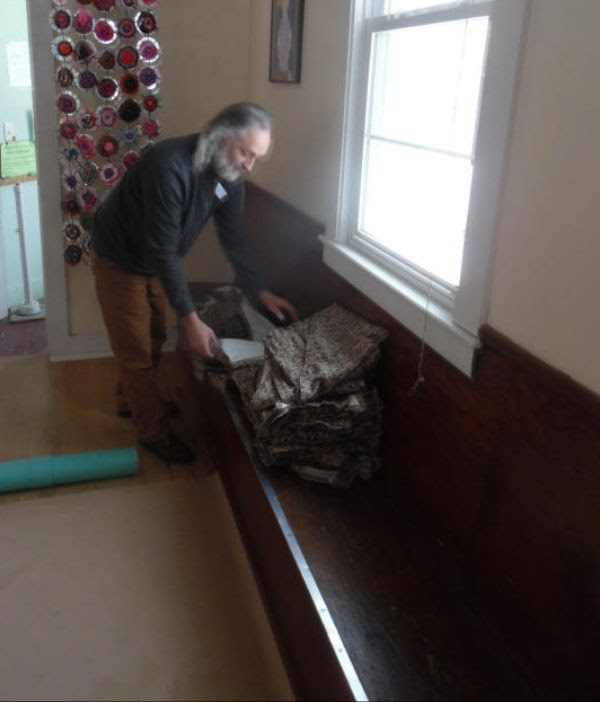 The latter will include upcoming construction of at least 18 acoustic panels, to try out reductions in the “reverb” that can make listening to speakers and each other difficult, as well as causing problems for the dance callers at contra dances. The generous donations the Friends have raised in their 2018 year-end campaign will finance these improvements, as well as building up the grant-matching capital for our hoped-for basement improvements. Our meeting will be followed by the Monthly Community Potluck Dinner, which last month attracted over 30 people. Join us about 6:00 for this enjoyable and tasty chance to socialize as we share food. Bring something you’ve cooked fresh, or something you’ve reheated from the freezer (we have a microwave, stoves and ovens in the kitchen to help), or a pizza or bread or a gallon of cider you have picked up on your way to the meeting or the potluck–we look forward to seeing you! We love seeing you at the Grange ~ Can you help us keep it open and running? Capital City Grange#469 was chartered in Montpelier in 1914; hence the old-fashioned name. In 1952-53 the members bought a lot in Berlin and built the hall we use today. The deed belongs to CCG#469 …as long as it is active. Since 2005, when 65 dancers joined CCG#469 to save the hall from becoming a private enterprise, the members of CCG#469 have been trying really hard to actualize the progressive agrarian values established just after the Civil War by national Patrons of Husbandry. YOUR involvement in CCG#469 meetings, events & initiatives is what we need now!! There is plenty of room for your participation, and I hope you will join us. You can see how at the bottom of this letter. 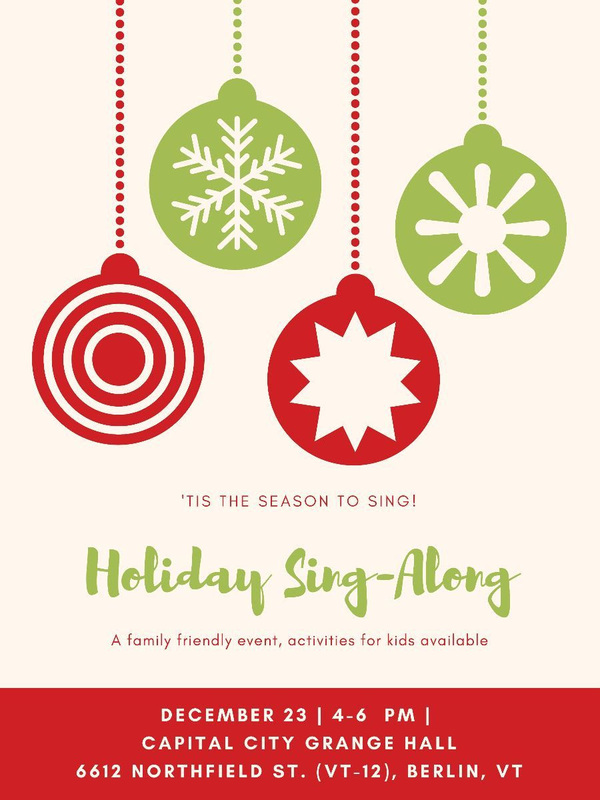 In 2019 CCG#469 will be doing KIDS TRADE & PLAY (0930-1130 on Second Saturdays) , collecting donations for Holiday Food baskets (look for donation boxes in the Hall), and the 3 rd Annual Holiday Sing-Along. We will continue our Cooking Workshops in 2019 and, if we can manage it, host an Open House/ Family Fun Day or another UPSCALE/RETAIL event , or maybe a craft fair. And we will keep our hall an affordable/accessible venue for community use. We will continue our regular business meetings on First Saturdays, October – June starting at 4:15pm. The agenda is always in the Grange NOTES (subscribe here capitalcitygrange.org), and usually includes singing + reports on community needs & community service, health concerns, and the building itself. This is followed at 5:30-ish by a program of public interest and, at 6-ish, with a FREE&OPEN, family-friendly potluck. EVERYONE is welcome! You can utilize your skills and develop new ones; CCG#469 needs someone to take over bookkeeping (“Treasurer”), program coordination (“Lecturer”) and building maintenance (“Hall Steward”). And you could wear a velvet sash! We also need to wash windows, clean the fridge, mow the grass, and get rid of the birds’ nests…to name a few chores. To RENEW/RESUME your membership for 2019, just send your check ($30 made out to Capital City Grange#469) to PO Box 208, Northfield Falls, VT 05664. If you are a NEW member, go here http://capitalcitygrange.org and complete the form at the bottom of the page on the right. Membership = only $30/calendar year . Mid-January update: Holiday boxes thanks, Grange cleanup, acoustics test project…and the Grange will be the new home of Dance,Sing & Jump Around! Grange Hall cleanup coming next Monday! Please join us for a clean-up party on Monday, Jan. 21st! Those of you who have been reading the Grange Notes will have seen the pictures of various parts of the Hall that show lots of dirt build-up, thanks to the busy people and active groups that use our Hall! So we are planning a Clean-Up Day! Coming on the Martin Luther King “Day of Service”, Monday, Jan. 21st! 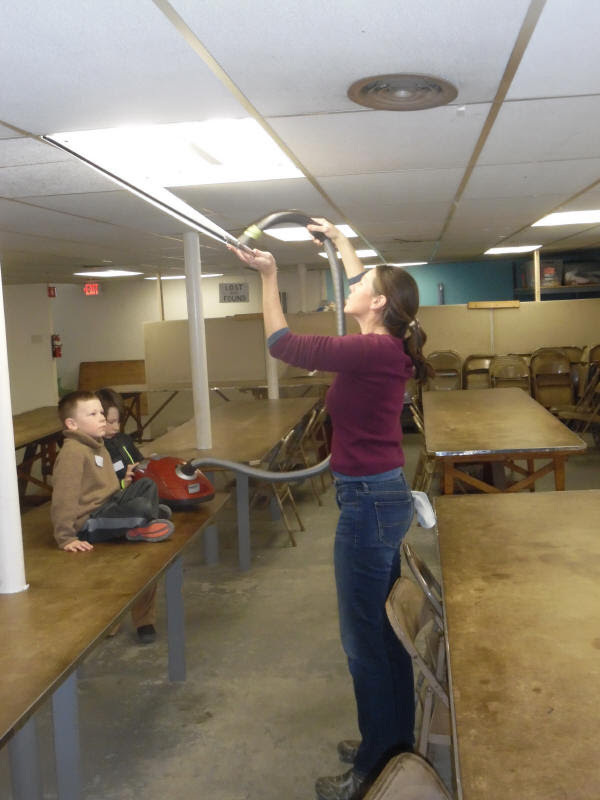 This is your chance to join other Grange Hall users and friends to spiff up the Hall. Bring some cleaning supplies, if you can, but we are mostly interested in getting you–and your friends!–to bring energy and enthusiasm to make it a productive day for all of us, leaving the Hall shining and smelling good. We plan on working from 10:00 AM to 3:00 PM, with time off for lunch from about Noon to 1:00 PM. Come for the morning shift, the afternoon shift, or the whole shebang! If you can’t come and clean, but want to provide some lunch, that would be great also. About the Martin Luther King Day of Service: in honor of MLK and his life of work for a better America, people across the country make this holiday a day ON, not just a day OFF, by volunteering in their communities. 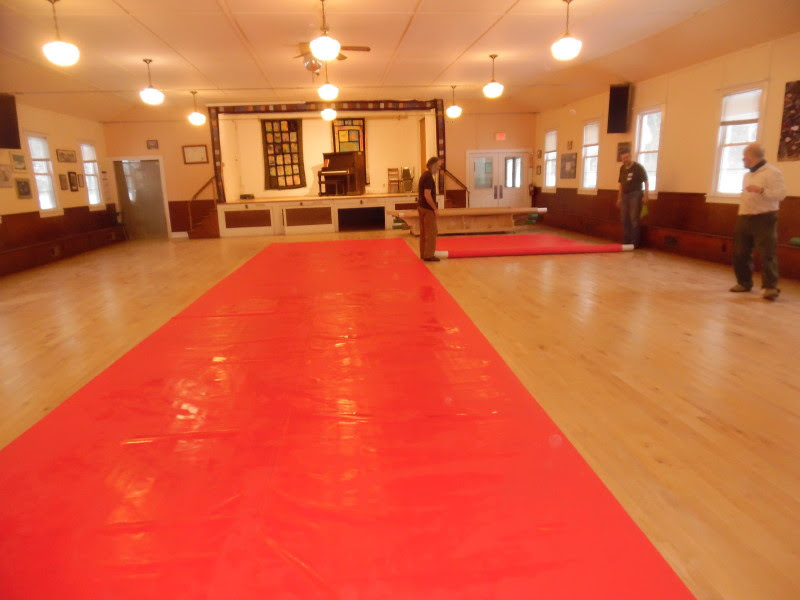 We are organizing this clean-up to make the Grange Hall even more welcoming and attractive. The Grange, an all-volunteer organization, owns and maintains this Hall to serve local community organizations, families and non-profit groups. We hope you’ll pitch in with us to make it even nicer. Past clean-up parties have been companionable and fun–as well as productive! More info? Call Tim at: 802-225-8921. Our first meeting of 2019, on Jan. 5th, brought us up to speed on a variety of issues, both within the Grange and in the wider world. We were able to begin right on time at 4:15, the slightly earlier opening time we’ve resolved to use. Our goal is to have time for the many items we cover in our monthly business meeting, allowing us to close the meeting by 5:30 to begin the program–which at this meeting was Rights and Democracy VT. See the report on Kate Logan‘s talk below. Thanks to every one who arrived on time and ready to go! After our usual opening ceremonies, we started with an Agriculture report. Merry passed on a suggestion from the VT State Grange newsletter, the Green Mountain Granger that Granges (and individuals) look for opportunities to purchase VT milk, for personal use and also for Food Banks, Food Shelves, etc. A good suggestion was made by Grange members–that people who want to donate milk should check that the recipient organization has the facilities to handle fresh milk. A better option may be to buy vouchers to allow the Food Bank or Food Shelf to purchase milk when they can distribute it. The motivation for increasing milk purchases is the plight of dairy farmers–the market price for the milk they sell is well below the cost of production. With prices adjusted for inflation, this is as low as the price has been since 1930! Please keep this in mind as the winter goes on–the needy families who depend on food aid, and the farmers who produce food all continue to need our help. Note also that the ongoing shutdown of the federal government has held up payment of the subsidies which are supposed to help farmers withstand the effects of the trade war on agricultural exports. Our report on Grange Home Ec was brief–the baking contest this year will be your own recipe for “Spice Cake with Cream Cheese Topping”. So there will be room for individual variations for taste, nutrition, avoidance of allergens, etc. May is often when we have the judging, so start experimenting! Grange Vice President Phyllis Skinnerdid a Health Concerns report went through recent research about dietary and lifestyle choices and their impact on health. For example, on the negative side, too much grilled meat (like 15 times per month) is associated with high blood pressure. 93% of bottled water sampled contain micro-plastic fragments. And–following sports tends to make you miserable, according to the research! On the positive side, eating more organic foods does reduce the risk of cancer, holding hands can help reduce pain (proven with brain-wave research), turmeric helps reduce depression (as well as joint pain), and full-fat dairy products have actually been shown to reduce heart attack and stroke. Moving on to the Hall report, we had a good presentation from Patty Giavara, Chair of the Friends of the Capital City Grange Hall, or FCCGH. She reported that the year-end fundraising campaign, via letters to past donors, has raised over $4,900 to help with Hall improvement projects! If you want to contribute, please to to the Support the Hall page, and click the Donate button to make a contribution via Paypal or your credit card. Patty reported on an interim project the FCCGH is planning, before we re-submit our grant proposal for the downstairs improvements. Because of the generosity of our donors, we want to use some of the money we have raised to make a visible (and audible) impact on an ongoing problem–too much echo or “reverb” in the Grange Hall. This makes it difficult to understand spoken words in meetings or from speakers, as well as dance callers at contra & other dances. The Friends are planning to buy materials to make 18 acoustic panels, which will be hung on the South wall, opposite the stage, as a test for reduced reverb and acoustic improvements. We’ll announce a work-party to do the assembly and installation when we have the plans finalized. This initial test will be followed by meeting with a variety of Grange-using groups, to see if these have had the positive impact we hope for, and to seek feedback (not the audible kind) on next steps. Additional panels can be made to increase the covered area, and panels can be put on other walls if that seems indicated. 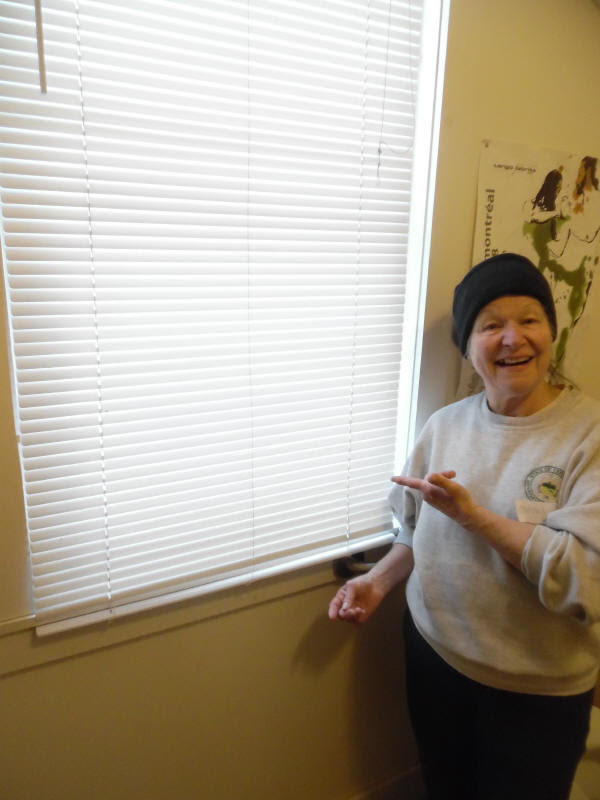 Please contact Patty: pattycope@comcast.net if you want to help out with planning, constructing, hanging or evaluating this acoustic panel trial. See below for a drawing showing the planned location of our trial panels! Note that the panels are shown as dark only for this drawing! Actual color will be light. The Grange meeting also was asked if the Grange could sponsor a dance series for small children, Dance, Sing & Jump Around, which has been organized by Grange members Liz Benjamin and Merry Shernock for the last few years. The rent for their previous location at the Plainfield Opera House has gone up. That venue also has poor parking located across Rt. 2 in the middle of Plainfield. They asked if they could move to the Grange, a more central location, with great parking as well–and a great place to dance, by actual test. The DS&JA events are held once a month from November through April, on the 2nd Sunday afternoons of those months, from 3:00 to 4:30. The Grange voted unanimously to sponsor this series, which brings together children from about 3 to 8 years old, who bring along parents, grandparents and friends. It’s an all-volunteer operation, with Liz Benjamin and Stan Carlson doing the calling, and a variety of local volunteer musicians, which have included Fran & John Mallery, Joanne Garton & students, Aaron Marcus and others. For more information, or to make a tax-deductible donation to the dance, visit the Dance Sing & Jump Around website! Spread the word about the Feb. 10th dance, from 3 to 4:30 PM, which will be the first at the Grange Hall. After we closed our business meeting, we got to visit with Kate Logan, director of Programming & Policy Development for Rights and Democracy of VT, our speaker for the program. She gave us a brief history of this relatively new organization, which was founded in 2016. RaDVT brought together people from the Workers’ Center of VT, plus people from the environmental justice and labor movements. The goal was to set up an organization that can provide political pressure by helping to elect candidates for local and state offices who support the progressive agenda of RaDVT. They want to develop more candidates from the grassroots, by providing workshops, training and organizing help to encourage committed people to run for various offices. They also have created a “People’s Lobby” to promote the positions and values of RaDVT in the legislature–and are providing workshops to give people the skills to effectively lobby their own representatives and senators. Their goal is to have 10-20,000 members in VT, and about double that in their partner organization in NH, with 200,000 people getting news updates through RaD. As partners with national organizations Center for Popular Democracy, People’s Action and Our Revolution, they aim to build a national network of grassroots political activism, planning for success through electing committed candidates, and supporting them politically and financially. After Kate made her presentation, she joined about 30 or 35 people who came for the potluck dinner–one of our best turnouts yet. Hope we’ll see you at the next Grange meeting and/or the potluck dinner, on Feb. 2nd! See the food line in the picture below. 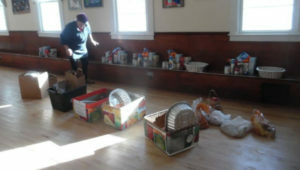 I just wanted to let you and the others who helped put the food boxes together, how much the families appreciated them! We have asked the families for feedback/ suggestions and got nothing but positive comments such as, “awesome’, “wouldn’t have changed a thing”, “loved it!”, and “kids loved getting a pie.” The flowers were a nice touch! How did these boxes happen? Merry Shernock used financial contributions from Kids Trade ‘n’ Play, a family that used the Grange Hall for a holiday meal, plus individual contributions to purchase frozen turkeys, roasting pans, pie crusts and fillings for chocolate pie (see the thank-you not for special appreciation for the pie), among many other celebratory items. 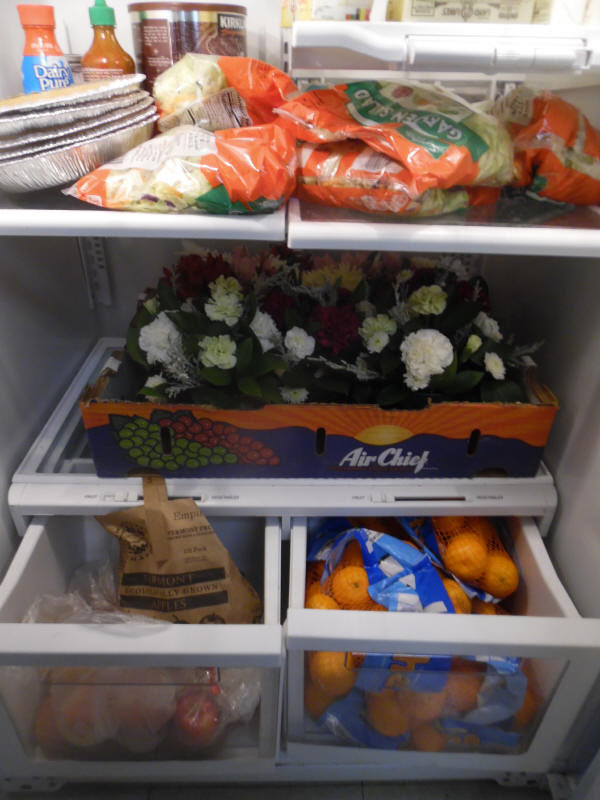 She also sorted out all the ingredients for the boxes, and solicited deals from grocery stores–including the donated flower centerpieces. 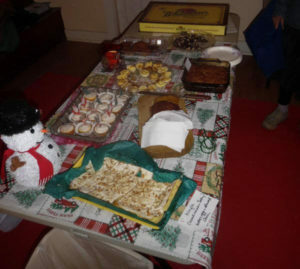 Some food was brought in by Grange members and other Hall users. Erin Barry brought in chocolate donated by Nutty Steph. Alison Forrest made the decorated boxes. I’m sure we will repeat this project for the next holiday season–we’d love to have more donations and more help assembling the boxes. We could do boxes for more families, with more help–we’ll put you on the list if you contact us! Below is a picture of the assembled food for a family–including a box of non-refrigerated items, and a roasting pan filled with refrigerated foodstuffs. Happy New Year! Time to re-start our engines at the Grange–join us for our next meeting on Saturday, Jan 5! We’ll have our monthly meeting this coming Saturday, and welcome anyone to come and join us. The meeting will feature the usual sing-alongs that we always enjoy–sneaky of the Grange founders to include them in the prescribed rituals for opening and closing meetings! We’ll also have updated reports on finances from our Treasurer, Merry Shernock, and on the upcoming Legislative session, from our Legislative liaison, Marj Power. The Hall report will give an update on the fundraising by the Friends, and the plans to experiment with acoustic panels to reduce the reverberation that sometimes makes it hard to understand speakers in meetings, or callers at contra-dances. We’ll be talking about membership–look for a special message asking you to join (or re-join) the Grange for 2019 in your e-mailbox soon! Come about 5:30 to hear Kate Logan, one of their Program Directors tell about the “People’s Lobby” that RaDVT has established at the State House, about the prospects for legislation they’re focused on, and to answer questions about their campaigns and how to get involved. 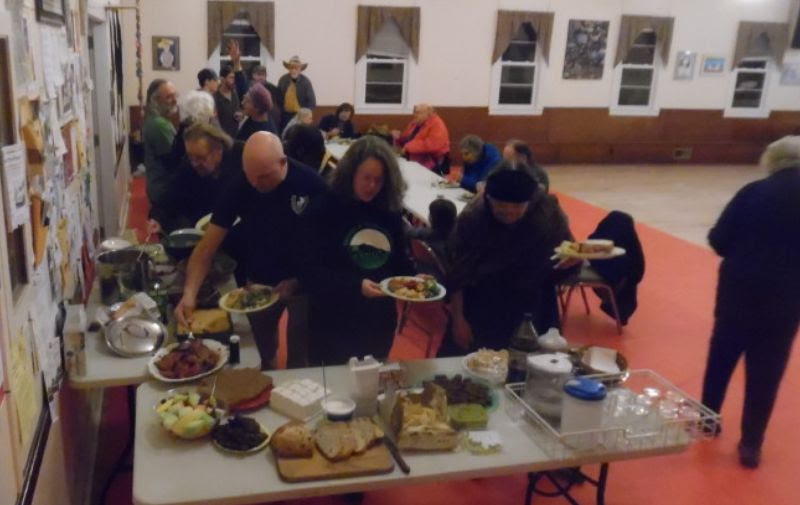 And then stay for the Community Potluck Dinner, at about 6:00, where you can share both good food and good conversation with everyone who has come for the meeting, the program, or for the contra dance that starts a bit later! Kate Logan will be there, hope you will too! P.S. we want to start right at 4:15, to make sure we have time for our program and plenty of time to eat! Did you hear what I heard? 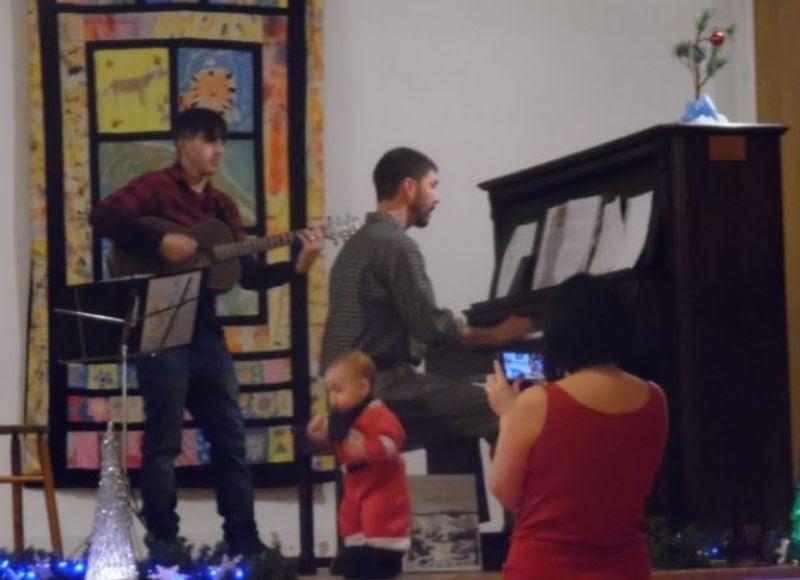 If you were at the Grange Hall on Dec. 23rd, you certainly did! We had lots of singers, a busy craft table, lyrics projected, lots of tasty snacks, piano & guitar accompanists…and an on-stage dancer! Our 2nd annual Holiday Carol Sing was at least 6 times bigger than last year–many thanks to the 30 or 40 or 50 people who came–it was hard to keep track! “Marathon Man” Matt Nunnelly was glued to the piano bench for the whole 2 hours, leading us in a wide variety of tunes. Intrepid Internet lyric-hunter Charles Mayhood had a large number of lyrics loaded on a laptop, and was able to search out others when audience members requested them! Charles also provided decorations and lights, which increased the holiday feeling. He also made the poster for the event. Ben Ducadeli donated a projector for Charles to use–and told us the Grange can keep it. We’ll use it for sing-alongs at Grange meetings as well as future Holiday events! 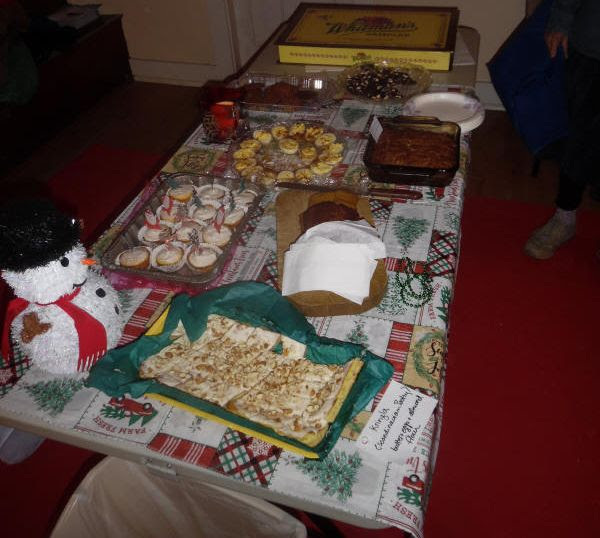 Many participants brought treats to share–Swedish Kringla, gingerbread, brownies, chocolates, muffins and deviled eggs–by no means a complete list. 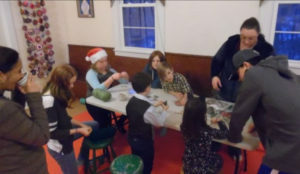 The crafts table was a big hit with kids, making simple, attractive holiday ornaments kids could display with pride. Thanks to Wendy, who set it up and kept all involved! Merry Shernock did a lot of publicity, sending out notices to everyone, putting up posters and encouraging everyone to come. All in all, it was a great pleasure to have so many people pitch in, and even more come to enjoy singing together. New Year, New Hall Clean-up! Now that I’ve taken pictures of some of the less-attractive parts of the Grange Hall, I’m looking forward to getting new shots of these same areas, cleaned up! How many of these places can you identify? Scroll down to the bottom of this part of the message to see where these are. We’ll supply some of all of these supplies and tools, but help us out by bringing your favorites! We are mostly interested in getting you–and your friends!–to bring energy and enthusiasm to make it a productive day for all of us, leaving the Hall shining and smelling good. About the Martin Luther King Day of Service: in honor of MLK and his life of work for a better America, people across the country make this holiday a day ON, not just a day OFF, by volunteering in their communities. We are organizing this clean-up to make the Grange Hall even more welcoming and attractive. The Grange, an all-volunteer organization, owns and maintains this Hall to serve local community organizations, families and non-profit groups. We hope you’ll pitch in with us to make it even nicer. More info? Call Tim at: 802-225-8921. Fuzzy light fixture in the Main Hall. 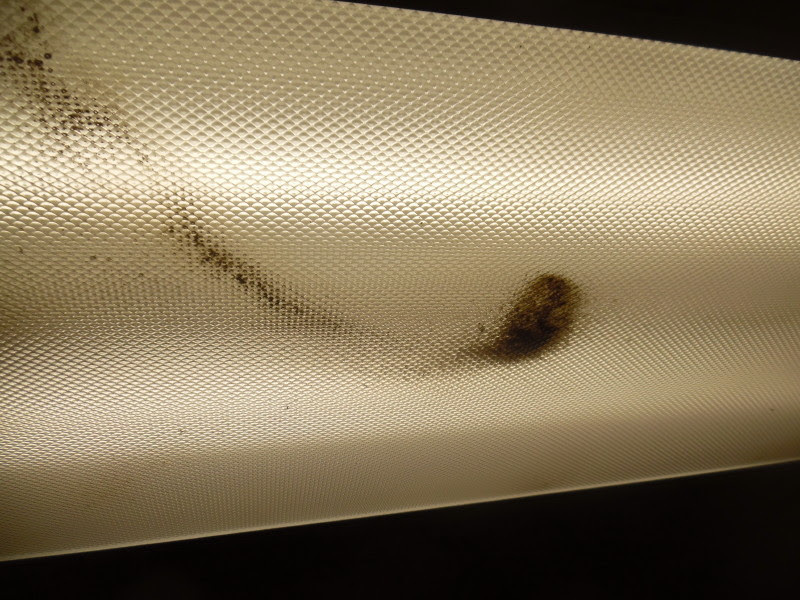 Sand and grit that have fallen from through the floor above onto the light-diffusers in the lower level. Dusty screen and dirty window in the Main Hall. 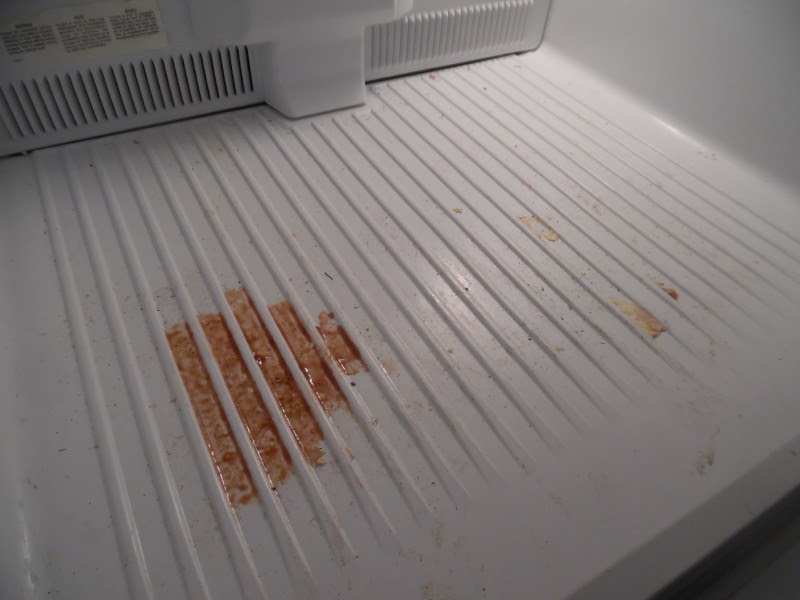 “Something” spilled in the freezer. 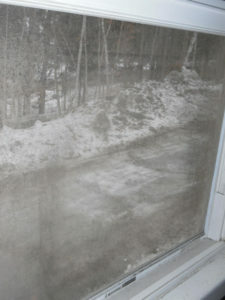 And it’s hard to take a picture which shows the dirt on the windows themselves, but it’s easy to see with human eyes! We can make a real difference…and have a good time doing it. Hope you can come! Quarter notes roasting, on an open piano…. We’ll gather ’round the piano, share our favorite holiday songs, some mulled cider and snacks. Kick off Christmas week with some non-sectarian, non-denominational, non-partisan, yet strangely enjoyable community singing! 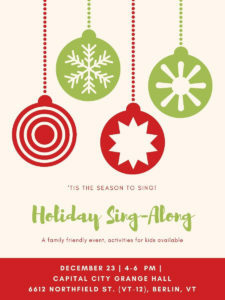 This coming Sunday, 4-6 PM will find us in the Hall and ready to sing with YOU! Everyone has a favorite song for this time of year–it need not be a “traditional” Christmas carol–could be a pop song that reminds you of the holidays, a unique family favorite that you want to share, just bring your enthusiastic voice, some lyrics if you can (or bring your smartphone if you want to use our free WiFi connection to look ’em up), and your willingness to be part of a musical celebration. Bring some snacks or cookies to share, if you want. 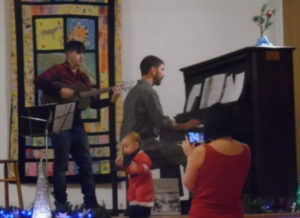 We’ll provide the Grange Musician, Mat Nunnelley, who is skilled at accompanying Grange members at our regular meetings, and loves Christmas songs as well. We’ll also mull some cider, provide some kids’ crafts for those that don’t want to sing along, provide some lyric sheets for a few songs at least, and a warm Hall for a community song-fest. 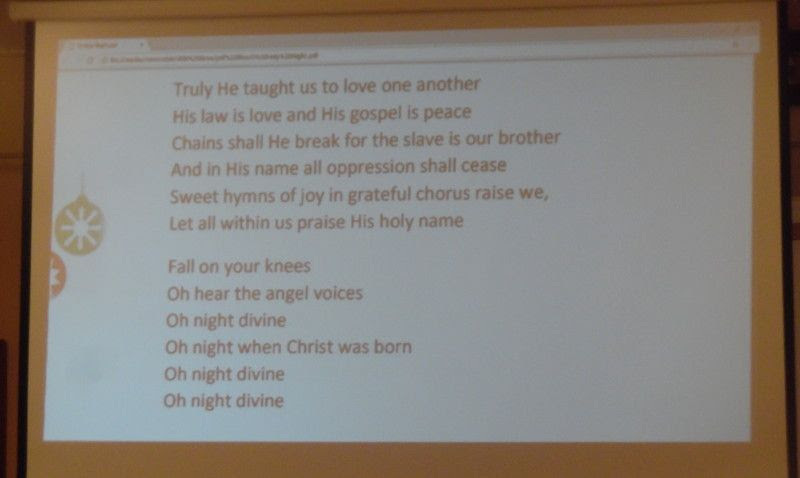 If you’ve been to a Grange meeting, you know that we sing at least a couple of songs every time–it’s one of the most enjoyable parts of the meeting! Now’s your chance to be part of the fun! As I write this on the 19th of December, Merry Shernock has just finished purchasing some more supplies to complete filling the 6 Holiday Boxes, which will be picked up by our co-conspirators at Head Start/Washington County tomorrow, Dec. 20th. We got some food donations dropped off in the boxes by Grange Hall members and tenants, plus some generous monetary donations. 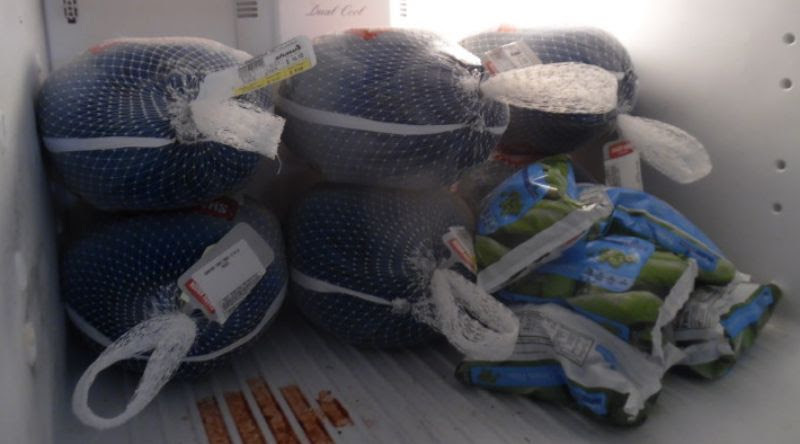 Merry already bought 6 turkeys & roasting pans, and has used the rest of the cash to buy a few more items (especially perishables) to make for festive holiday meals. The families which receive these can prepare their own feasts, plus having some more treats for the rest of the season. 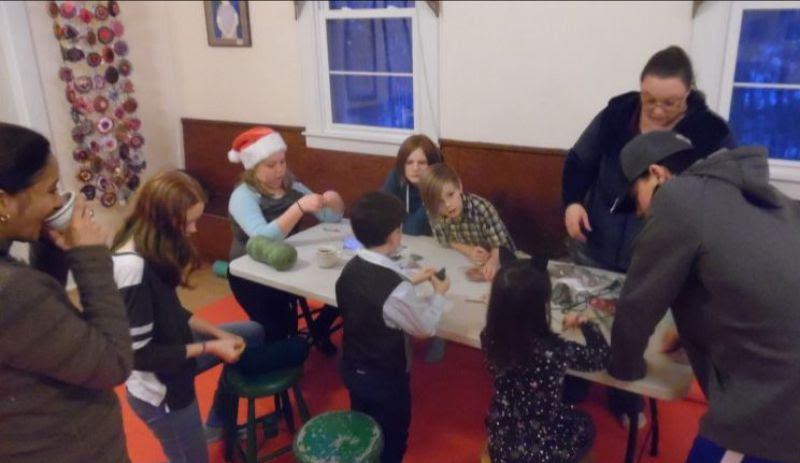 We want to express special thanks to the patrons of “Kids Trade ‘N’ Play”, and to the Premont extended family that celebrated Thanksgiving at the Grange Hall. 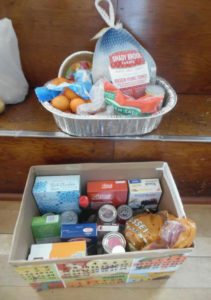 Generous cash donations from these Grange users enable us to really fill up the festive “dinner boxes”, made by Alison Forrest. Chocolates donated by Nutty Steph will be an extra special treat. One of the original Grange values is to “dispense Charity“–living our lives so that we can share resources with others who need it, instead of thinking always of “more for me”. Thanks to everyone who brought in food, or donated cash, or donated a special item! Frozen turkey, onions, potatoes, yams, clementines & apples, mac & cheese mix, chicken soup, pancake mix & syrup, 3 sticks of butter, pie crust & chocolate pie filling, salad mix & dressing, matzo crackers, pineapple chunks, cranberry relish, crackers, Nightly Calming herb tea–plus a centerpiece for the table, courtesy of an anonymous donor! 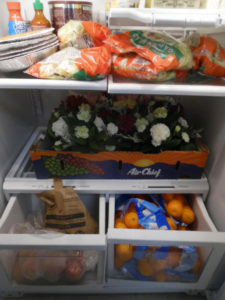 Below, see pictures of the boxes, and the refrigerator and freezer stuffed with the chilled items, waiting to be picked up! Another “Grange Tradition” event to put on your calendar: Hall Clean-up! 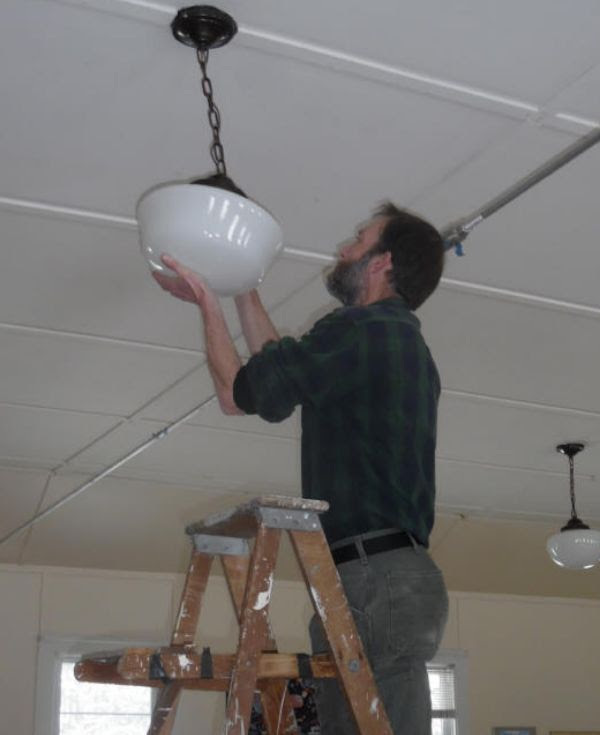 Every year or so, we need to provide some TLC (tender loving cleaning) to the Grange Hall. Our cleaning service cleans the bathrooms and the floors of the foyers–but that leaves a number of areas untouched. Have you noticed a layer of dust on the lights in the Main Hall? Dust and dead flies in some of the windows? 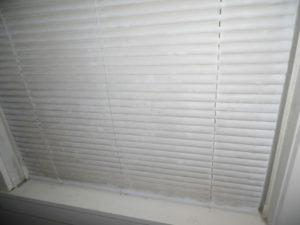 Smears on the glass and dust on the blinds? 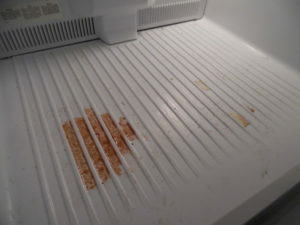 Spilled food in the freezer? One of the highlights of our December Grange Meeting was a presentation by Jake Ide, the director for Investments and Philanthropy of the VCLF. As you may have heard, the CCG has invested part of our “Rainy Day” fund in the VCLF. We invited Jake to tell us what our money may be used for, and about the work of the Loan Fund in general. Jake gave a brief slide-show about the 30 year history of the VCLF, describing their flexible lending policies and diversity of their loans, and their desire to help build community institutions. They focus on providing loans that will foster jobs, affordable housing, quality health care, natural resources, working landscapes, downtown-located businesses and organizations, child care programs large and small, and much more. Examples: among their borrowers is the Champlain Housing Trust, one of the largest in the US, which has developed 92 houses, and served 11,000 residents over many years. They also helped Fat Toad Farm, in Brookfield to develop their goat’s milk caramel production! The Loan Fund has made 275 loans, totaling over $105 million since being formed in 1986, with about $30 million on average out on loan. A large part of the money which they loan out comes from philanthropic funds–but 45% comes from individuals, an unusually high proportion compared to similar loan funds across the U.S. A lot of Vermonters seem to agree with their philosophy that financial returns should be only one consideration for an investor–their focus is on the community return. Their goal is to do more than just provide interest income. It’s important to note that the VCLF has never failed to repay an investor–a major consideration when our Grange decided to invest $5,000 in the VCLF, with a 10 year commitment. They assured us that if we suddenly needed the money, we can arrange to withdraw it early–for example, if the roof blew off. As we learned about the VCLF, we gained a lot of confidence that they share another Grange value–Grangers are “noted for Fidelity”. This includes making and keeping commitments, and handling finances openly and honestly. We decided the VCLF was a safe place to invest. Once money is donated or invested in the Fund, it is loaned out to worthy borrowers. 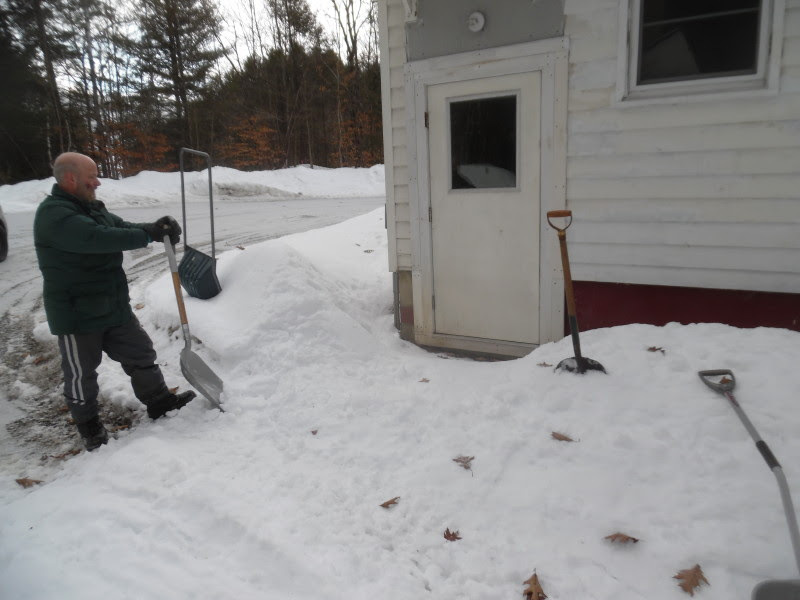 As loans are paid back to the Fund, the money is again loaned out to the next qualified organization or business, keeping Vermont money circulating and building Vermont communities. In addition to making loans to borrowers, the VCLF operates a no-charge business resource center to help them operate more efficiently, and more effectively–which of course helps to keep the loan payments coming back. Want to learn more? Their website: InvestinVermont.org has much more information about their history, their loans and the resources they can offer. We enjoyed meeting and speaking with Jake Ide, who also shared our potluck dinner!